In November 2015, three enthusiasts of art, crafts, and watchmaking relaunched Czapek & Cie after an intense period of research and development. François Czapek, a Czech-born Polish watchmaker who fled to Geneva, in 1839 partnered with Antoine Norbert de Patek. In 1845, at the end of the partnership, he created Czapek & Cie and achieved great success. The Quai des Bergues 33bis, inspired by a 1850s timepiece, won the Public Prize at the GPHG 2016, one year after the public revival of the brand. The Faubourg de Cracovie integrated 5 Hz chronograph is the company’s third collection and was named after the location of Czapek third boutique, which he opened in 1850 in Warsaw, Poland. The Place Vendôme, a suspended tourbillon with GMT function, is the second step in the Czapek Renaissance. It highlights the travel through time from Past to Present and now Present to Future. The Quai des Bergues Ladies collection reflects elegance and the distinctive style of Czapek watches. 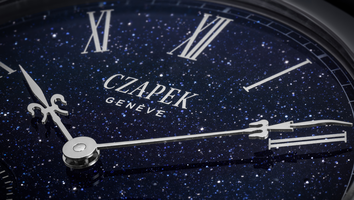 Czapek took the most distinguishable and unique features of the brand’s ancestral aesthetics and adapted them for the watch lovers of the twenty-first century, as if François Czapek was still alive and creating contemporary masterpieces.